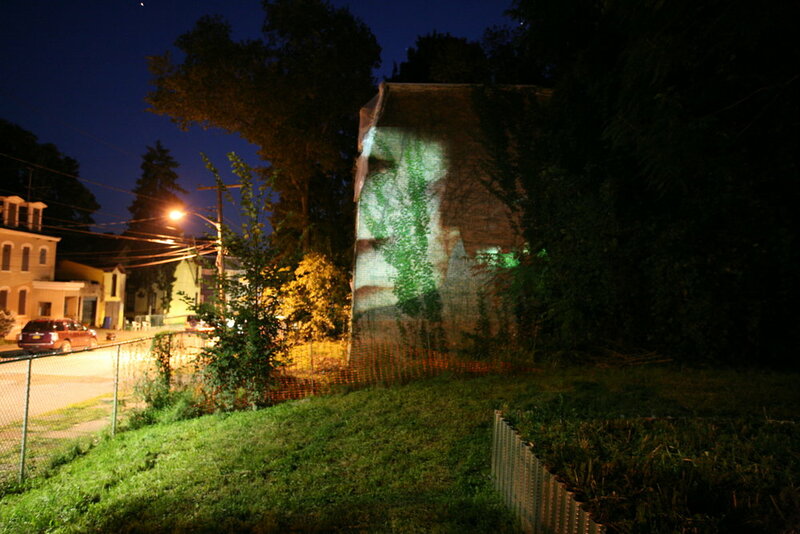 Newburgh, N.Y.—Newburgh Community Land Bank Artist-In-Vacancy presents Clown, a performance & silent film choreographed and performed by Kira Alker and Elke Luyten to be screened on the facade of 116 Lander Street. Elke Luyten and Kira Alker have been creating collaborative movement performances since 2003. Their work has been showcased internationally at such venues as the REDCAT in Los Angeles, the International Conference on Performance Art Theory in Mexico, the Dream Shot Festival in Belgium, the International Dance Festival in Estonia and Honen‐in Temple in Japan. In New York, they have presented work at Movement Research at the Judson Church, AUNTS, Dixon Place, Dance New Amsterdam, FLICfest, CAVE, BKSD, Danspace Project and Dance and Process at The Kitchen. Their work has been supported through residencies from the Lower Manhattan Cultural Council, the Watermill Center, Stiftung Insel Hombroich and Dance New Amsterdam. They have received financial support from the Durfee Foundation and The Kevin Spacey Foundation: America. In 2015, Elke and Kira created the choreography for David Bowie’s short film “Blackstar”. Elke also danced in “Blackstar” and subsequently performed in Bowie’s final music video “Lazarus”. Kira is originally from San Francisco and holds a BA in Theatre from Pomona College and an MA in Performance Studies from NYU. Elke is from Belgium and has a BA in Dutch, History and Geography.